Wed, 17 Jul at 6:00 PM - Fri, 19 Jul 2019 at 11:00 PM . Totally Lost tickets include 3.5hr Lost In Ibiza sunset boat party + 4 free drinks + Jamie Jones' Paradise DC10 + ABODE @ Amnesia + Cuckooland Pool Party Ibiza Rocks. 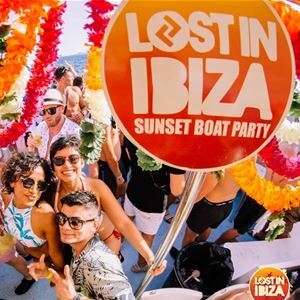 LOST IN IBIZA is famed for throwing LEGENDARY SUNSET boat parties. With SUPER STAR DJ'S, straight off club lands most-wanted list every week!! Rave the waves to the stunning backdrop of the IBIZA SUNSET. Sail Ibiza's stunning COASTLINES on double-decked 250-passenger CATAMARANS accompanied by a thumping FUNKTION 1 SOUND SYSTEM & INTERNATIONAL DJS. Friendly, HAPPY VIBES, up-for-it crowds. SOAK up the SUNSHINE, spot DOLPHINS, free ALCOHOLIC FRUIT, glitter & BODY PAINTING, DRESS UP BOXES, party props, live INSTAGRAM streams, professional PHOTOGRAPHERS & video crews. BRING PRINTED ONLINE RECEIPTS TO RIO BAR, SAN ANTONIO SEA FRONT ON DAY OF EVENT ANY TIME BETWEEN 1PM - 4:30PM. LOST IN IBIZA PRE-PARTY kicks off at 3PM in RIOS AIR-CONDITIONED glass-fronted CLUB with stunning SEA VIEWS. After the boat docks you have couple free hours to freshen up for your night ahead.